This week, the “Legends and Mythology” portion of our 1980s Fantasy Film Festival concludes with Chris Columbus’ Young Sherlock Holmes, a film that may not fit perfectly into the festival, given that almost all of its most fantastical elements actually occur as the result of drug-induced hallucinations. However, it features some nifty steampunk gadgetry, along with some deliberately heightened elements such as an ancient Egyptian cult practicing human sacrifice in Victorian London, that take it outside the realm of anything resembling realism. It is also, in many ways, a forbear to Harry Potter on numerous levels–certainly as far as the film series goes, the screenplay having been written by Chris Columbus, who went on to direct the first two Potter films and produce the third, but possibly even to J. K. Rowling’s books. Although as far as I know, Rowling herself never confirmed the connections as being deliberate, there are a lot of stylistic similarities between the stories, and I wouldn’t be surprised if it was at least a subconscious influence on her, assuming she saw it at a young age. Columbus himself has stated that he drew on Young Sherlock Holmes when directing Harry Potter and the Philosopher’s Stone. Among other parallels, which I’ll get to in a bit, it has a similarly at-times Victorian storybook feel. As far as why I chose the film for “Legends and Mythology,” to be honest, it doesn’t fit perfectly into any of the festival’s categories (it doesn’t fall into “Sword and Sorcery,” “Terry Gilliam,” “Animated,” “Superheroes,” “Fairy Tales,” or “Sci-Fi”), yet this felt the most accurate, firstly because Sherlock Holmes and John Watson have practically become figures of legend in their own rights, far exceeding even their author, Sir Arthur Conan Doyle’s, original output, and secondly due to the ancient Egyptian mythological connections, which, to be fair, are really only sketchily drawn and not extremely accurate. But this is Hollywood, after all. Even for those who haven’t seen this truly terrific film, the premise of Young Sherlock Holmes is not difficult to guess. As its name implies, it’s a prequel that presents the world’s greatest detective back when he was a teenager. 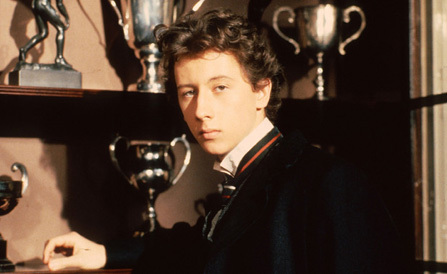 Rather than adhering to the letter of the law regarding the canon, however, the film instead takes a more playful approach, introducing a young John Watson as a new kid at Holmes’ boarding school who ends up being assigned the bunk right next to his. Even as teenagers, both Holmes and Watson have many of the traits for which they are most famous, and any that they don’t have, they will be well on their way to attaining by the time the end credits roll. They will also cross paths with Holmes’ most famous enemy, who at this point is going by a different name and is actually teaching at their school as a fencing instructor! 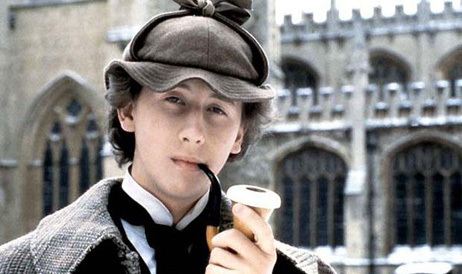 In some ways, Young Sherlock Holmes is reminiscent of what the TV series, Smallville, did with the Superman mythology, presenting an alternate version of a famous character getting started in his “profession,” so to speak, and crossing paths with allies and villains far earlier than in the original stories–minus that show’s glossy, pin-up actors and angst. And although the idea could have made for an intolerably cheesy production, the film succeeds by managing to be both surprisingly straightforward about the whole thing while also conjuring a genuinely enchanting atmosphere. As far as the first point, it isn’t populated by precocious little children mugging for the camera. As Sherlock Holmes, Nicholas Rowe does an especially excellent job of bringing to life a conceivable portrait of what Holmes very well could have been at a younger age. While not devastatingly handsome, he has a certain haughty, arrogant charm that has an almost indescribable magnetism to it which compels other characters and the viewer to pay attention to him and fall under his spell. Although rarely tactful, he exudes the assurance that he is at least always right, and somehow maintains likability even without any definably likable, personable qualities, much like the older Holmes.